Don’t let these pantry pests get the best of you. Vanquish the beetles with this battle plan. No matter how scrupulously you clean your kitchen, you may still open your cabinets one day to find them crawling with tiny beetles. Unlike insects that enter through doors, windows, and crevices, weevils sneak in with your groceries. The adults chew into grains and lay eggs, making it virtually impossible to tell if you’ve purchased a sack of something that contains larvae. 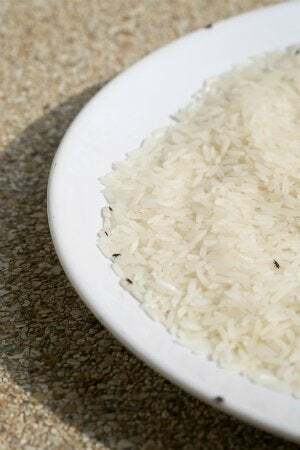 Of the some 60,000 species of weevils, the ones that threaten your larder are the rice and maize varieties (dark reddish-brown with red or yellow spots, about 1/16-inch long) and the larger, shiny, dark brown-to-black grain weevils. But have no fear! The following step-by-step will walk you through how to get rid of weevils for good. 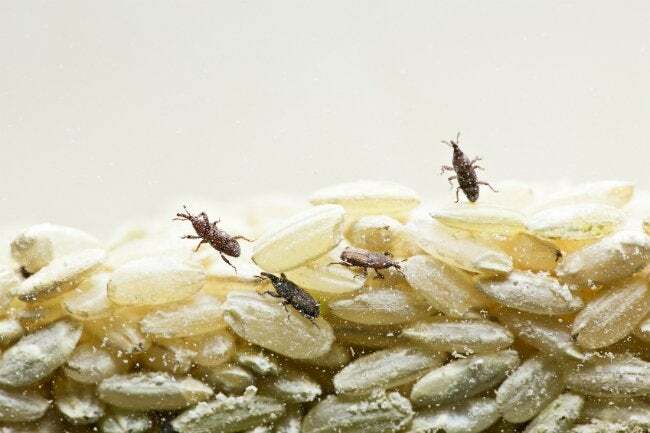 By the time you spot weevils, odds are they’ve infested other nearby food items. So in order to oust them, you’ve got to purge your pantry of unsealed dry foods, including oats, rice, barley, flour, corn meal, pasta—even pre-packaged box-type dinners that don’t have sealed internal pouches. And don’t stop there: If boxed products have sealed airtight bags inside, toss the box and label the bag with an indelible marker. Do this even for boxed products weevils won’t eat, such as gelatin, because the pests might have entered the box and could later emerge to re-infest new products. Put salvageable foodstuffs in the freezer for four days, which will kill any larvae that might be hiding in the product. Items you don’t think will withstand freezing—dried herbs, for instance, that may lose their zing—can go in a sealed bag or container and be stored elsewhere. Before returning anything to the shelves, proceed to Step 3. Thoroughly clean the pantry and cabinet shelves. 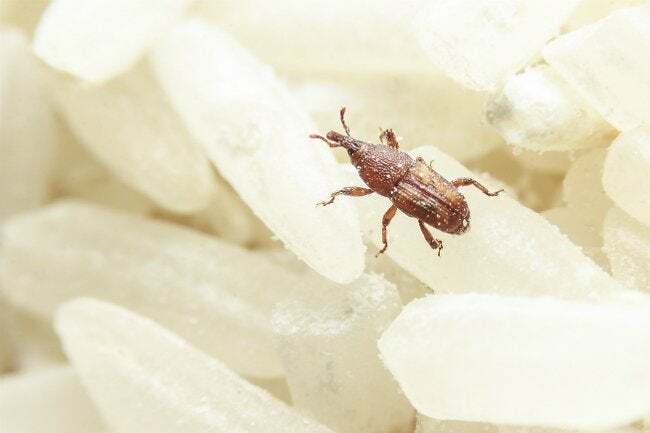 Everything has to come out—canned goods, spices, aluminum foil, whatever you store in there—in order to get rid of every weevil. Vacuum the shelves, making sure to get the nooks and crannies, and then take your vacuum outside to dump its canister. Wipe down the entire vacuum (canister included) with disinfectant before bringing it back inside. Sponge all shelving and cabinet interiors with either hot soapy water or spray cleaner, and let dry thoroughly. Finally, spray shelves and cabinet interiors with a household insecticide labeled as effective for killing weevils. Note that the formulation need not be chemical based. Many homeowners have reported success with non-toxic options like ERADICATOR, which you can find at home centers and through online retailers like Amazon. No matter your chosen insecticide, be certain to follow all the manufacturer’s safety precautions. Circumstances depending, that may or may not involve keeping children and pets away from the pantry temporarily. Likewise, note that it may be necessary to clean the area one last time before re-stocking the shelves. Sure, these four easy steps can get rid of weevils in an afternoon. But since any and all innocent-looking dry food packages could contain weevils, the only sure way to prevent another infestation is to put dry staples, such as rice, beans, lentils, quinoa, wheatberries, macaroni, and cereals in the freezer for four days after purchase before stowing them. Alternately, store these items in individual sealed plastic or glass containers. While these suggestions might seem like overkill, all it takes is one female weevil to start another invasion.